Growing up I always felt connected to this culture because it seemed like a matriarchal culture (the mom was the heart of the house–and she was adored and respected). Family is a big deal. Community is a big deal. Parties are loud and fun. The culture is celebratory. The people appreciate good food, dance, art, music, film and more. They don’t appear to equate life happiness with bank accounts. They work hard but understand living a joyful life is something you choose to do, and you build this by having a positive attitude on an individual level. In no way do I mean to homogenize “Latin cultures” because they are all VERY DIFFERENT. But I do want to take a moment to share my adoration of this culture that embraces life, love and of course food. I love ahi tuna–but it’s expensive–so it should be purchased for special meals that are really special for you. This week I spent in Topanga Canyon with my boyfriend and his family. I really enjoy the time I spend with Jacob’s family and I really enjoy cooking for them when I’m there. This trip I decided to make fish tacos w/veggies, mango mint salsa, israeli couscous and for appetizers I baked light brie-stuffed-dates tied in a bow of turkey bacon. It’s much less complicated than it sounds! Regarding the photo below, remember in Clueless the movie when Cher describes someone as a “Monet” painting–far away it looks pretty but up close it’s a big ol’ mess….regarding my dates the opposite is true. They look a little intimidating far away but up close they resemble delicate elegant presents wrapped in a bow. I promise you these are absolutely velvety and delicious–they are sweet, savory and salty and melt in your mouth. I chose ahi tuna because it was fresh. I am by no means a “fish expert,” but I know fish that is fresh does not smell fishy. That’s how I judge freshness. When you cook the tuna you can use a grill (ideal, but it’s not critical). You can see I have a lot of ingredients listed. You by no means need to use everything I used! Make your fish tacos your own! Have fun with it! For the fish tacos, if you are feeding a group of 5, you will need…. 12. Soft taco shells (I used blue and yellow corn tortillas from trader joe’s. The blue are gorgeous–just a little grainy so be fore-warned). 9. 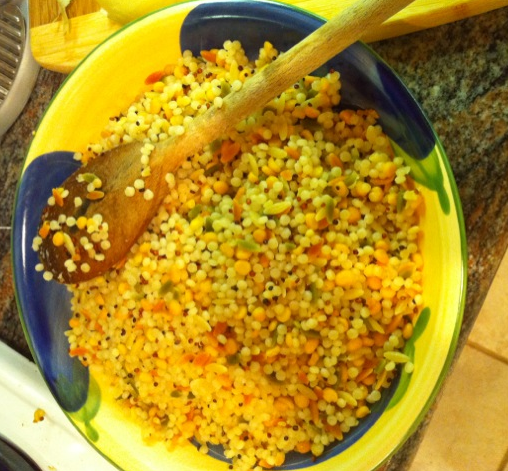 The Israeli Cous Cous are very easy to make. You really just add water and any spices you like. I would suggest choosing cous cous or mexican rice (yellow). I tried to use only a tiny amount of margerine in this dish. You might need that (or a little butter) to flavor the rice and the fish. Some of you frown upon using any butter or butter replacements. For this group–don’t freak out, just make sure you use something like olive oil to keep your food flavorful. And please don’t be nervous about a nominal amount of butter or fat. It’s good for you (better than chemical substitutes). 10. 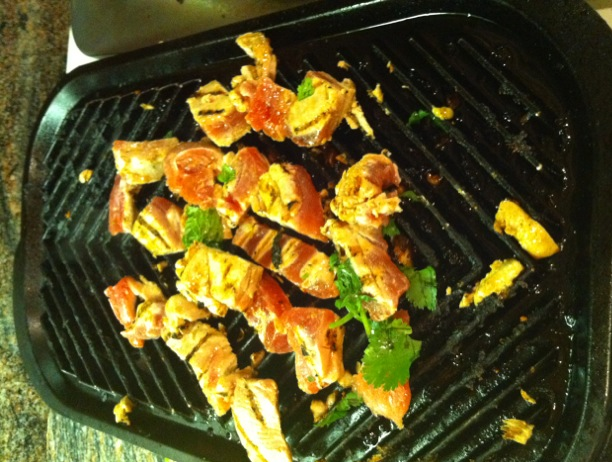 Heat fish on skillet–first either spray grill or cover in a nominal amount of olive oil. Use cilantro, pepper and a tiny bit of salt to flavor fish. A pinch of butter or butter replacement–as mentioned above–might be necessary. 11. When fish is browned on either side, and still a little pink in the middle, remove from grill. 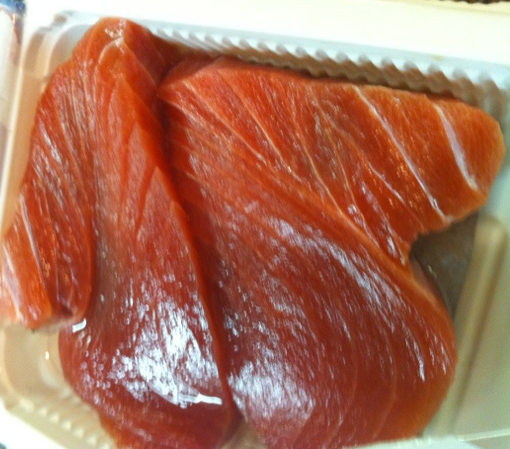 Remember it’s ahi tuna–served seared and often rare in salads or in sushi rolls. This will not hurt you–it will make your taste buds smile! 12. Put soft shell tortillas on the grill to warm them and give them a crispy quality. 13. 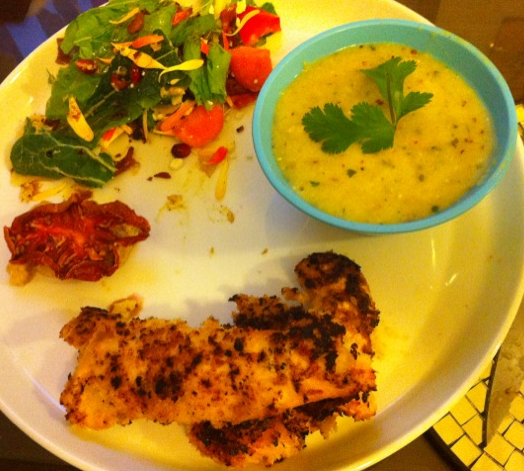 If you want to be fancy, add a stem of cilantro to the corner of each plate for decoration. If you are preparing tacos for your guests individually, you can add a sprig of cilantro to the top of the sour cream dollop that caps your fish taco tower. I served the tacos with the mango salsa, some greens, shredded cheese, beans, rice and a dollop of Fage yogurt (replacing sour cream). I wasn’t lyin’ it’s family style. Notice the apps are almost gone (my cheese stuffed dates w/turkey bacon). 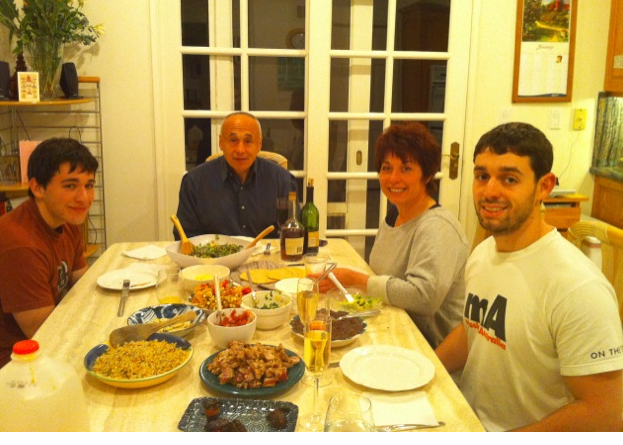 My boyfriend Jacob and his awesome family around the dinner table. 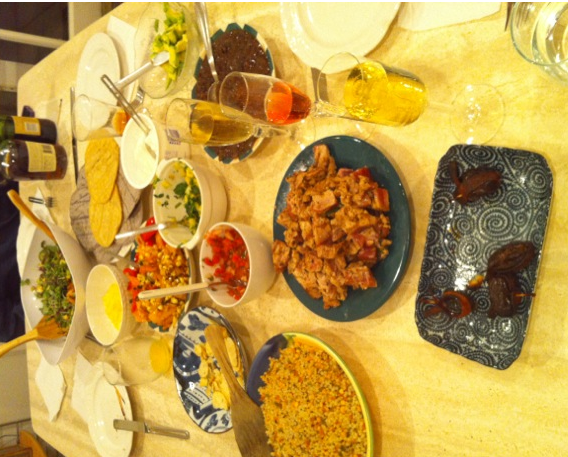 Our Latin inspired Shabbat dinner. 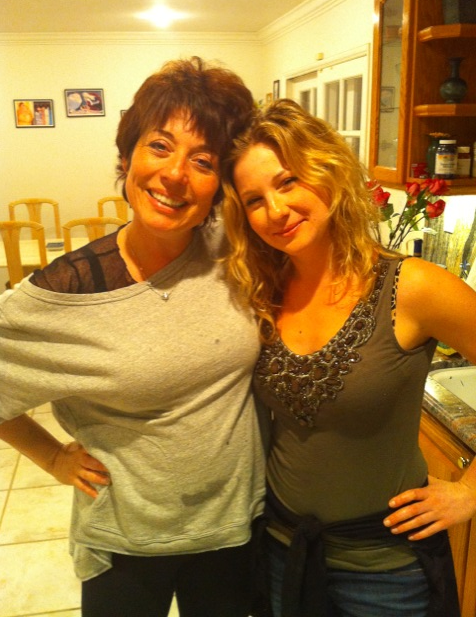 Me with Jacob’s mom (supermom) Ella. She is my hero! (Yes mom you are my hero too!). In conclusion, I know it seems like a lot of work but it’s actually an easy recipe to prepare if you are cooking for a group. Thanks for staying the course with me (literally)! Last night I cooked what seemed like a simple meal that was packed full of flavor. Probably a good meal to have post-superbowl. So if it’s early enough for you I suggest you run to Trader Joe’s (or the Farmer’s Market) to grab these ingredients. I tend to use a lot of ingredients-but it is not a sin to leave some of them out. 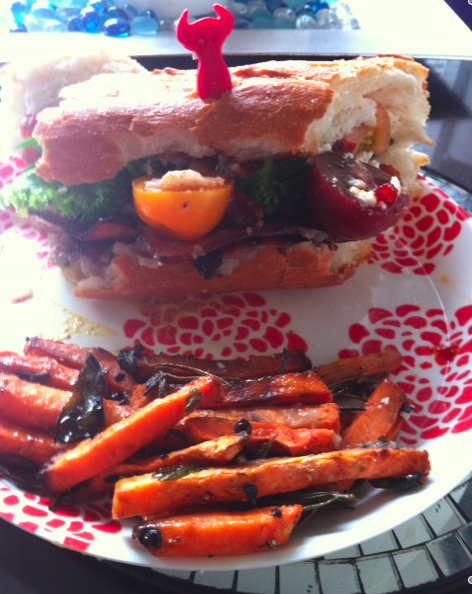 This meal was very flavorful–mostly because I purchased very fresh ingredients from the Farmer’s Market. The idea is pretty simple, but the flavors are not! I always make my own dressing–it’s super easy! Just use what you have in your spice rack, herb garden along with olive oil and balsamic vinegar (black). Be creative! Shake it up and pour over salad (not drenched–just light pour). I added a giant dried roasted tomato on top of mustard horse-radish for the chicken. The ultimate comfort food! Today I literally almost burnt my apartment down. Hence the title of the blog. This was while my mom was telling me she’s going to CRM Evolution this year with a friend. Hah–you never know when your world will collide with your mom. Before this happened I dragged Jacob through a one hour run today. The weather was pretty overcast–perfect for a jog. Before that happened Jacob went out and bought really fresh sourdough from a local Italian bakery in North Beach this morning. When we came home famished from our run I wanted to make a killer sandwich–monster sandwich–since we earned it by shleping in the fog in our running gear. A lot of the ingredients of this meal are from Trader Joe’s. I am a huge fan of this grocery–they have the best products at the most competitive price, and the customer service is excellent. In addition they ALWAYS have samples of food and coffee. Love that! 3 slices of Turkey Bacon (I get this from Trader Joe’s). 1 handful of heirloom tomatoes (again TJs). Few pieces of mustard lettuce–or Romaine if that’s what you have–any crunchy lettuce. Drizzle of Fat Free feta (TJs). Jalapeno Chutney (DELICIOUS–a nice contrast to the salty bacon). You can follow the brand @Sukhis on Twitter. Order some! Shallots (to cook the bacon in). Olive oil spray (cuts the calories of regular oil). 1/2 cup Dreamy Mushroom Stoup (a shmear of this replaces the density of a fatty/creamy cheese–this is an optional addition). Putting the Monster Sandwich Together. There’s no science to cooking this monster sandwich. The only work comes from frying up the shallots & turkey bacon.